This level has medium difficulty. 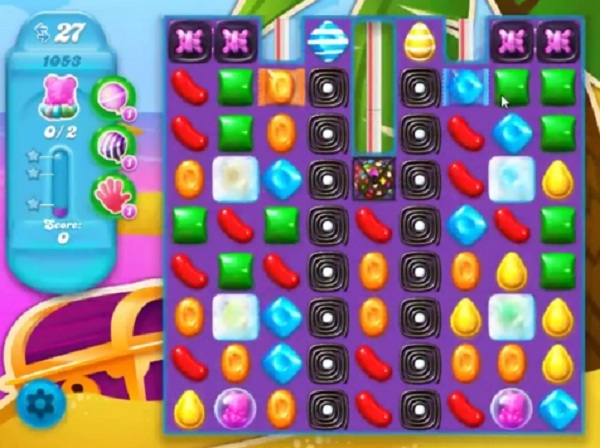 For this level try to play from top part of the board to shuffle the candies and make special candy as you get the chance. Combine them with each other to break more candies to move bear. Or play near to bear to move it. De video klopt niet met het echte spel! Wat een vreselijk level,je komt er niet door en de video is anders dan de echte.de zwarte drop is geblokkeerd en dat is niet in de video. Need to get the right board have been here for a while. So bored. Boy, this video is so so much harder than you show. First we do have 30 moves BUT with the additional blockers/2/3 hit icings it takes a lot more moves than the three they gave the level. King says this level is super super hard level and they are right. I haven’t come close, period. Need an updated video. I have played this level 30 times(probably) and have not come close getting one fish above the line. Meant to say this ‘ level ‘ is much harder than you show.